We drove the RV right onto the ferry along with 130 others! Jim and I grew up along the Jersey shore but never managed to get as far south as Cape May. To our surprise, it was highly recommended by travel itineraries for the northeast so we included it in our Eastern Seaboard trek. At my brother's suggestion, we drove to Lewes, Delaware to catch the ferry to Cape May rather than drive the circuitous route on land. Since we had missed our ferry going to Cape Hatteras, this was our opportunity to get the RV on the water. The ferry terminal was about a two-hour drive from his home and we passed through small towns and farmland. We had no idea there was so much farmland in Maryland and Delaware! 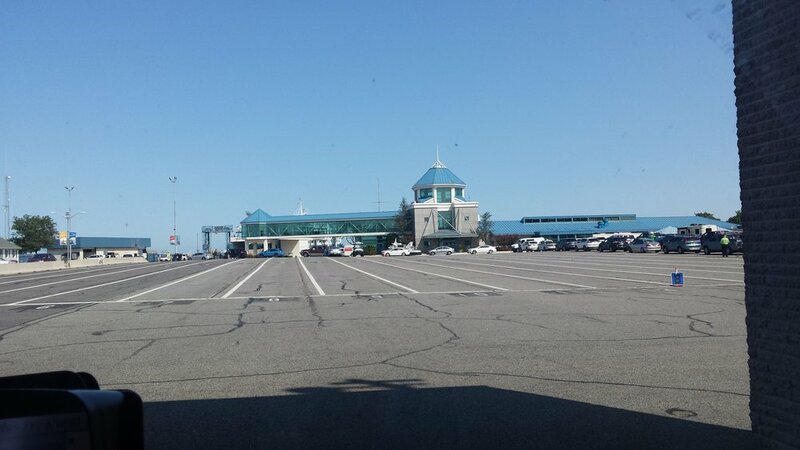 The ferry terminal finally appeared and, after checking in, we parked the RV in line for boarding. The ferry can accommodate almost any vehicle that travels the highway system, so the RV was well within the height and weight limits. It wasn't long before it was time to move again. The attendant guided us on board and we parked in back of a larger RV. Locking up the unit, we headed to the observation decks. The sun was shining and the breeze was stiff as we stood at the rail and watched the coastline grow small behind us. 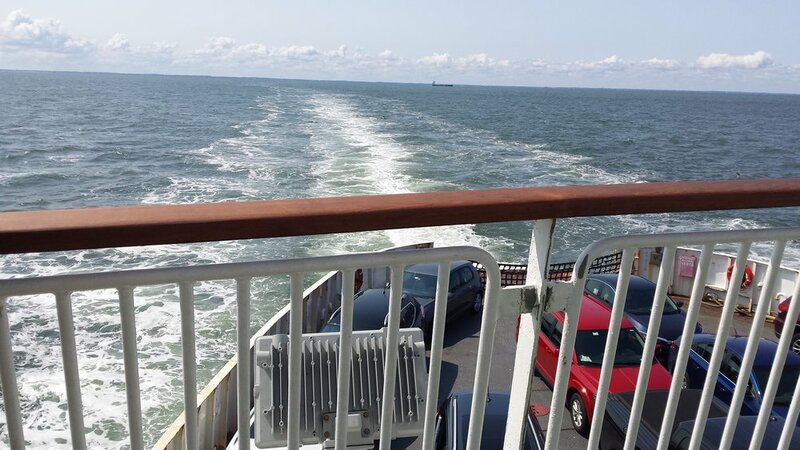 The trip took about an hour and a half to cross 17 miles of the Delaware Bay. As we drove off the ferry into the Cape May terminal, we charted our course for the RV resort. We will have a two-day visit here and, rather than set up camp right away, we decided to simply check in, find our site, then get out to explore the area and find some lunch. We passed a local pizza shop on the way in, so we ordered a pie to go and took it to the state park near the Cape May Lighthouse. 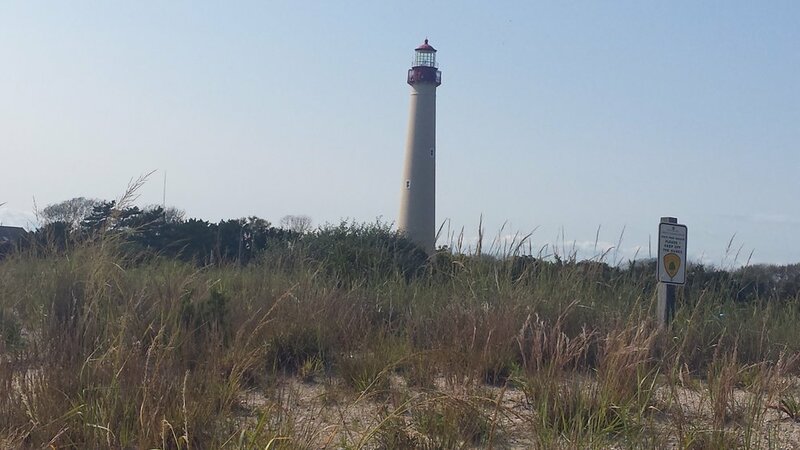 The signs pointed us to the very end of the cape where we found a wide expanse of beach along with a lighthouse, nature center, museum, and bird watching platforms. After a relaxed lunch watching the local birds, we walked over the dunes to the beach. The first thing we noticed was a massive concrete structure half-buried in the sand. Though it was large, we couldn't quite make out what it might be. Jim spotted a marker standing about ten feet away and we made our way over to read it. It explained that the structure was the remains of a World War II bunker. Massive, eroding, concrete walls and a sprawling footprint gave it a haunted look. Graffiti marred its walls but it was impressive nonetheless. At one time, it had stood in the water on pilings, but time and tides had captured it in the sand. The placard mentioned there was a twin building on the opposite shore in Lewes Delaware. The two bunkers offered protection to the shipping channel during the war. We strolled the wide, sandy beach for an hour or so looking out over the Delaware Bay to Lewes from where we had boarded the ferry, then headed back to the RV to do a little local touring. Since a storm fried our surge protector at our last campground, we needed to find a replacement. No luck with the small supply stores in the immediate area so we resigned ourselves to finding an appropriate store on the way out of town tomorrow. For now, we headed back to camp for a quick look at the Weather Channel to follow the impending storm south of us. We tracked hurricane Irma across Florida and then up through Georgia- our home base. My brothers live in South Florida along with their families. My sisters and their families, as well as our children and grands, are in Georgia, so we worried for three days about how each family was faring. Gratefully, everyone came through it without too much damage, though most were without power. When the storm finally pooped out, we could resume our trip with fewer items on our worry list. We were not up to investigating the next hurricane brewing in the south Atlantic. Hopefully, it will not chase us up the coast! 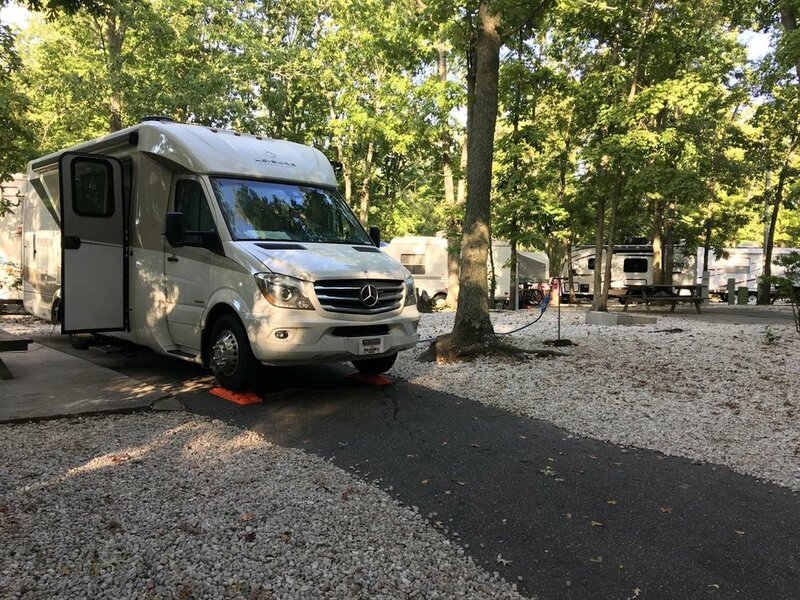 The campground, Seashore Campground and RV Resort, was amazingly clean and well kept. White river rock covered the campsites which were outfitted with fire pits, picnic tables, cable and full utility hookups - a real plus! The spots behind us emptied out through the evening and, by morning, we found ourselves the only RV in the entire row of campsites. The campground has many amenities including a fitness center, pool, mini-golf, and a children's play area. A gentleman on a bicycle stopped to talk with Jim as he worked on the RV. It turns out, he recently bought the same brand of RV and was happy to find another owner to get a few questions answered. He and Jim traded tips on using the RV for quite some time before I joined their conversation. Owning a bed and breakfast in Cape May, he and his wife bought the RV as a get-away vehicle. They have been so busy with the B&B that travel was nearly impossible. So, they decided to turn the B&B into condos and rent them out. He was just finishing up the construction and staying at the campground in his new RV preparing for their first adventure. 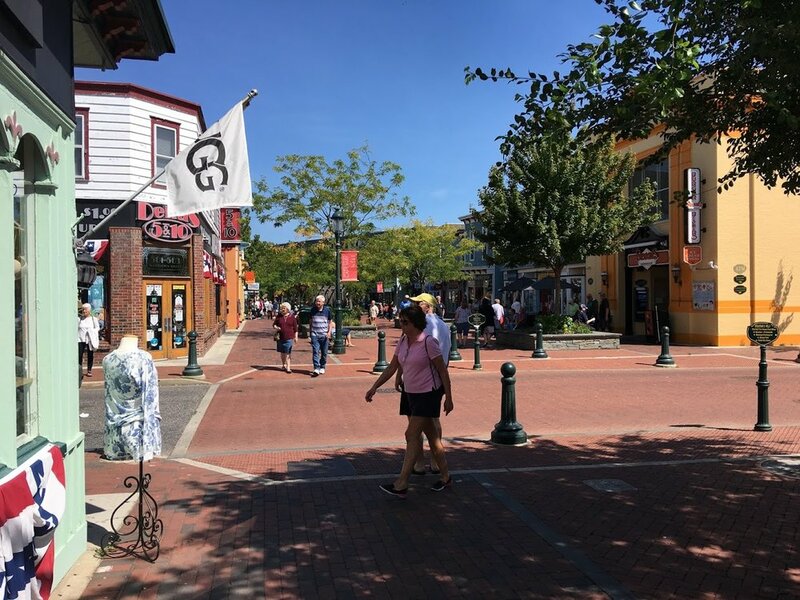 Day two brought more lovely weather and a trip to historic downtown Cape May. The quaint Victorian homes and cozy streets made walking around a visual delight. We parked the RV a few blocks outside of the historic district and strolled to the beach front, up and down the narrow side streets admiring all the neatly painted Victorian homes, many of them B & Bs. The Washington Mall sported dozens of crowded shops and restaurants. We were hoping to find a good local restaurant for lunch but it seemed each one we tried was too crowded. Finally, a few blocks away, we found a quieter spot called Carney's and enjoyed great burgers overlooking the beach. One last stroll around the neighborhood and we set off to find Cape May Winery. We didn't expect to find a full winery here in Cape May, but we were pleasantly surprised. As we drove up, we admired Cape May Winery's attractive main building and its surrounding grape-ladened vines. There were two barns in the back used for harvesting and wine production. The property was beautifully landscaped and provided multiple opportunities for interesting photos. The tasting room offered a choice of 5 wines from their catalog while the more intimate tavern offered three selections from a limited menu. We liked the quieter atmosphere of the tavern, and decided to enjoy a "flight" of three wines. The host encouraged us to take our selections anywhere in the vineyard. There were tables scattered around several patios near the vines, as well as a roof top deck, and a veranda with colorful umbrellas. 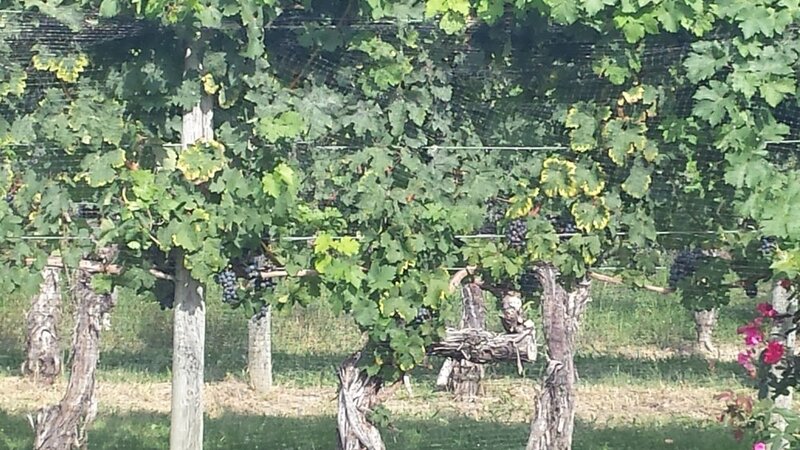 The vines were heavy with fruit... more good wine to come! We chose a table overlooking the vineyard near a few barrel stacks. There are 70 acres here with the oldest vines in Cape May County. Their specialties are the viniferous grapes including Cabernet Sauvignon, Pinot Grigio and Chardonnay, among others. Our wine selections included a cabernet sauvignon, a fermented-in-oak chardonnay (their signature white), and a vintner's choice red blend. All three were good, but the chardonnay captured the taste of summer so we added a bottle to our collection. The afternoon shadows were growing and our energy was fading, so we headed back to camp for dinner. This trip, we prepared several meals in advance and put them in freezer bags. That makes preparing dinner a quick affair after a long day of sightseeing. This was one of those nights! A quick meal of roasted chicken and vegetables with a glass of the wine we bought at the vineyard finished off the day. We spent the evening reviewing our route north to Atlantic Highlands. It is only a two hour drive, but it will take us on a 40 year journey back in time. We grew up there, met there, and began our life together there. Seeing long-time friends, old haunts, and enjoying a sentimental journey will be a great way to move our itinerary towards Maine. Should be an interesting couple of days!